Tidy gives you a clumping litter with two weeks of ammonia odor prevention,* working around the clock, at just half the weight. Now 100% Dust Free – Don’t be Dusty, Keep it Tidy. 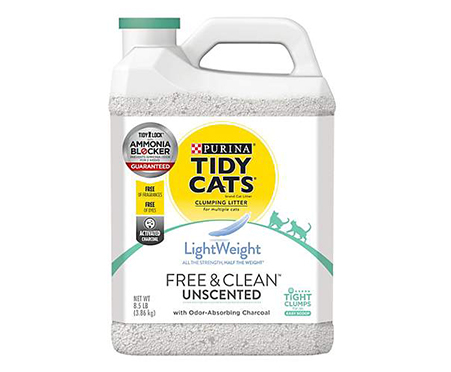 Purina Tidy Cats LightWeight Free & Clean with Ammonia Blocker* clumping cat litter is free from fragrances and dyes, giving you an unscented litter option to meet your and your cat's preferences. Tidy Lock technology locks away odors, and the included Ammonia Blocker prevents ammonia odor for up to 2 weeks when used as directed,* helping to keep your home smelling fresh and welcoming. Lightweight and now 100% dust free. Use just like traditional scooping litter. 1. Pour to depth of 3-4 inches. 2. Remove solids daily. 3. Add more litter to maintain a depth of 3-4 inches. Pour close to the litter box for maximum Tidy-ness! Clean the cat box with warm water and a mild detergent between litter changes. Tidy Cats Free and Clean Unscented Lightweight Cat Litter is a really good product. My little kitty took to litter right away. Will definitely be switching my usual brand. I used this Tidy Cats lightweight unscented litter for almost a week and when I pass by the litter box, there is no unpleasant odor detected. My cat had no trouble adapting to the changed litter. My only objection to this litter is that it does produce some dust that my cat tracks around the house. This is better than some other litters I have used, but not perfect. The Tidy Cat Free & Clean Unscented Light Weight Litter is amazing. With three cat it works great. Tidy Cats Free & Clean Unscented Lightweight Litter is effective at keeping the litter box smelling clean and I enjoyed that it was not heavy like many other litters. I love Tidy cats Fred &clear scented lightweight litter. I have multiple cats and this litter keeps the smell down and clumps up easier then my previous brand. I was able to try this brand from pinchme.com and the retailer. I would recommend this cat litter. I got the Tidy Cats Free & Clean Unscented Lightweight Litter from Pinchme and I love it! I couldn't believe how something this light would work as well as my current litter. I was so wrong, it works better and my picky cat loves it as well. I got a full size sample of Tidy Cats Lightweight Free & Clean Litter as a freebie from PINCHme.com, for my cat. The bottle really was lightweight as it says. There's no mess, no dust floating over the air that I usually get from other brands, and no scent, so it's just fresh. This is definitely a future purchase. Thank you. Loved receiving this sample to try in our litter boxes. First, the litter is lightweight so the boxes are easier to pick up and move around. Our cats seem to like this litter and it seems to absorb very well. I was concerned that being "light weight" litter it might not perform as well but that is not a problem. I plan to purchase this Tidy Cats Free & Clean Unscented Lightweight Litter again soon. Would highly recommend. I received a free sample of Tidy Cats Free & Clean Unscented Lightweight Litter from PINCHme. I liked that the litter was lightweight and easy to carry, and that it was a more natural litter than others on the market. I did not like, however, that the Free and Clean Unscented Lightweight Litter was not dust free. The amount of dust we experienced was so much that we had to stop using it. We have used other Tidy Cats products and they have not been as dusty as the Free & Clean Unscented Lightweight Litter. I received Tidy Cats Free & Clean Unscented Lightweight Litter a free product from PINCHme. I was very surprised by this litter not only by how extremely light the product was but that it actually helps with the smell of ammonia. And boy did I test out the ammonia claim I waited 2 days before a cleaned out the litter box and have 4 cats so if that does not say something I don't know what will. So every time I have to clean the ammonia smell is so overwhelming but with the Tidy Cats Free & Clean Unscented Lightweight Litter it diminished so cleaning the litter box is a more tolerable task. Tidy Cats Free & Clean Unscented Lightweight Litter was surprisingly effective! It not only clumped as usual but it didnt stink as I thought it would. My cat is sensitive to scented litters so this addition was great. She didn't have any issues using the litter and the fact that its lightweight makes it easier for transporting. I received the Tidy Cats Free & Clean Unscented Lightweight Litter free from pinchme to try and it's true to its name as its definitely lightweight. So much so it can be a little dusty so pour with caution. It tracks around a bit probably because it's so lightweight it can stick to their little paws easier. I'm not really complaining though because my cat always make a mess anyways. Even being unscented it doesn't smell because of the ammonia blocker and odor absorbing charcoal. It clumps just fine and is easy to scoop out when cleaning. I'd purchase in the future. Tidy Cats Free and Clean Unscented Lightweight Litter works great! I have used this brand many years and it clumps well, and keeps odors at bay! Never tried the Tidy Cat Free and Clean Unscented Lightweight Litter before (though I do use the Tidy Cat brand on one of my three cats - shoe won't use any other brands). She loves the litter and will use it again with her. Its great its unscented without any fragrances. I receive this free sample from Pinchme for Tidy cats free and clean litter, easy to use kept the smell down not as heavy as usual but I like it. Tidy Cats Free &Clear Unscented Lightweight litter is the best!! I have 10 rescue cats and will definitely be buying it by the bucket! We have a cat and kitten and they both like useing the Tiny Cat Unscented Lightweight litter.I think they like it more because there not scent at all.So lightweight and no smells coming from the litter box. I received a sample of Tidy Cats Free & Clean Unscented Lightweight Litter from PinchMe for my honest review and I'm glad I did. It really is surprisingly lightweight. I like that it is unscented and that I didn't have litter dust wafting up towards my face as I was pouring it in his box. It's easy to clean and my cat seems to like it just fine. We will use this going forward. There's nothing worse than animal smells mixed with fragrances. This unscented producr exceeded my expectations and I will be purchasing in the future.